This custom Lodge-inspired hand crafted billiards table was custom built by our master craftsman using reclaimed Fire Juniper wood. This Is Not Your Normal Crude Log Table. 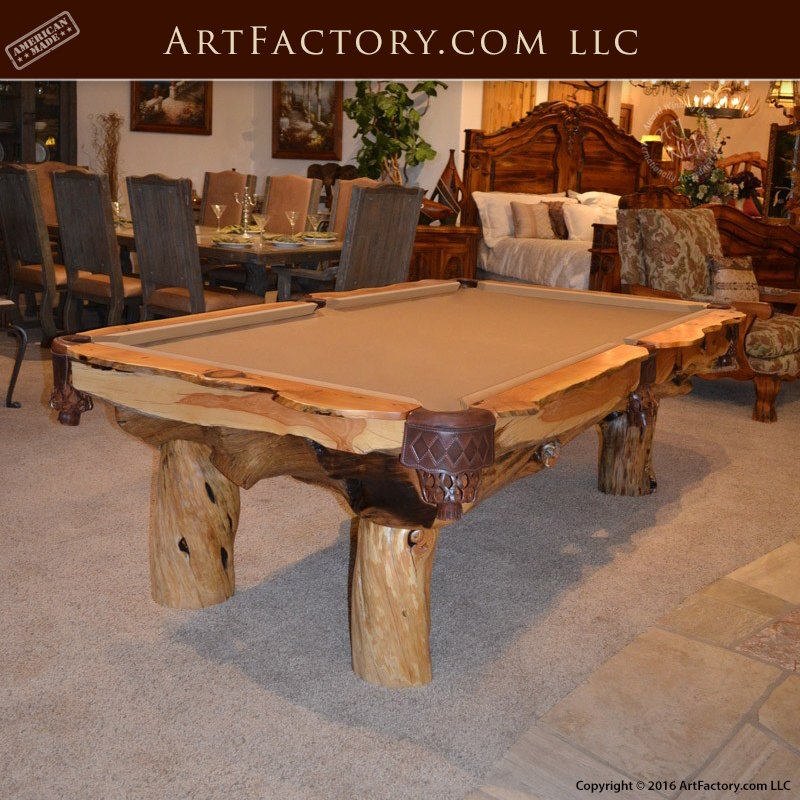 The rustic design of this custom pool table incorporates the beautiful wood grain designs of the natural wood used in creating this high-end entertainment furniture piece worthy of any Gentleman’s room or Man-Cave. The custom billiards table is made from full length timber, solid Fire Juniper, with inlays of Walnut wood for the sights,1″ thick fine ground Italian slate, and hand tooled leather pockets. All custom furniture designed and created at ArtFactory.com is made in Original craft, not reproduced, using the same hand and materials as all our historically made quality furniture. Backed by over a century of true craftsmanship, this designer investment quality billiards table will become a true family heirloom and a valuable antique. Our custom solid wood furniture and pool tables are built from solid natural air dried wood, not fast process forced dry wood using kilns. Joinery used in our hand crafted furniture construction is mortise and tenon, hand hewn by master craftsman, never using any fast production low-quality processes. Wood finishes on these designer billiards tables includes a fine art 10-process hand rubbed finish to an antique collector’s world-class standard. The best quality slate and cloth, and rails are used on all our pool table designs. Discuss your dream billiards table design with a ArtFactory.com designer at 1-800-292-0008. This hand crafted billiards table was custom created for a client using juniper wood, hand forged iron hardware, precision ground Italian slate, and handmade leather designer pool table pockets. Please do not confuse this rustic pool table with other crude log or lodge tables. This table is constructed in the same manor and quality as all of our fine furniture tables. All designer wood furniture from ArtFactory.com are built to last the old fashioned way, in Original craft, call us today to start your custom furniture design at 1-800-292-0008.